We are continuing our series on “Blues For Alice” with the 4-note groupings. What we call 4-note groupings are simple patterns that are used to outline a chord progression. Those patterns only have 4 notes and are neither a complete scale, nor an arpeggio. Yet, they are very melodic and will give us enough harmonic information to outline the chord changes of any song. I first heard the term coined by Jerry Bergonzi in his “Inside Improvisation Series For All Instruments”. MAJOR: Root, M2, M3, P5 played over Maj7 chords and Dominant 7 chords. MINOR: Root, m3, P4, P5 played over min7 chords. DIMINISHED: Root, m3, P4, dim5 played over min7(b5) or diminished 7th chords. I recommend that you first start with playing the groupings from the same string— maybe all from the 6th or 5th string, and gradually learn to start them from any string. The highest string we may start a grouping will be the 2nd string since we need 2 adjacent strings for each grouping. Make sure you sing the patterns as you play them, as it will help you remember their sound. 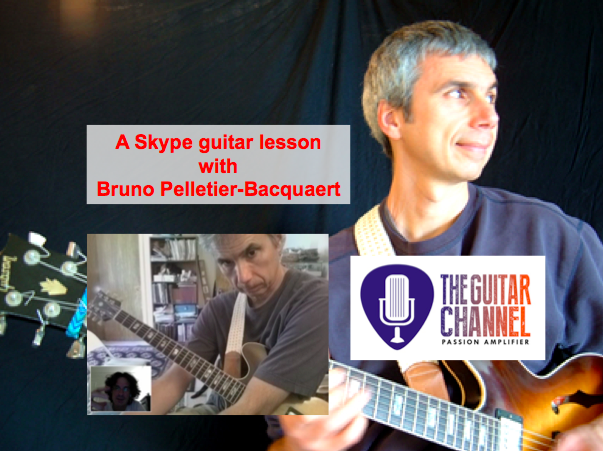 If you have any questions or comments, do not hesitate to contact me through The Guitar Channel by commenting below or directly through my website brunojazz.com.